Copyright 1998-2008. Laurence C. Hatch. All Rights Reserved. All offline use, duplication, saving to media, or printer is prohibited by law. 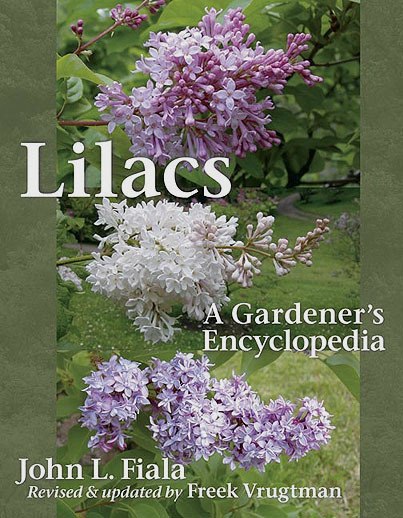 The ultimate reference to lilacs is now available from a major book vendors including www.amazon.com and www.bn.com. 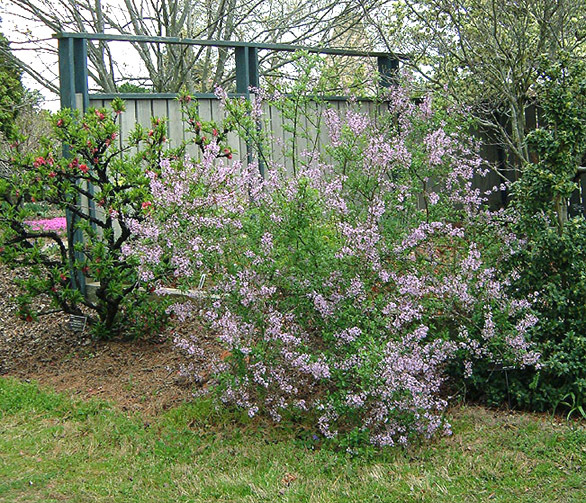 Based on Father Fiala's first edition, this is a major revision and update by Freek Vrugtman, International Cultivar Registration Authority for the genus Syringa. The 416 page guide is comprehensive in all aspects including all 21 known species and 10 of the natrual hybrids. An amazing 600 color plates are included (most of them new), now covering the newest introductions from east to west. This book is highly recommended and will be a valuable addition to your library for years to come. 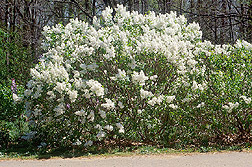 Syringa oblata var. dilitata (Nak.) Rehder next to cultivar var. alba 'Frank Meyer' which has been one of the best whites. The later reminds one of an Exochorda which bloomed the same week in March here at the Raulston Arboretum. 'Frank Meyer' has a slightly smaller in the inflorescence than this variety selection but peaks 7 days later. The week after this photo was taken, 'Frank Meyer' was still bright white while the variety selection was turning very brown. This variety is useful in warmer climates such as Raleigh North Carolina where S. vulgaris is less reliable for blooming and prone to mildew at times in the 100/100 (temp/humidity) days. 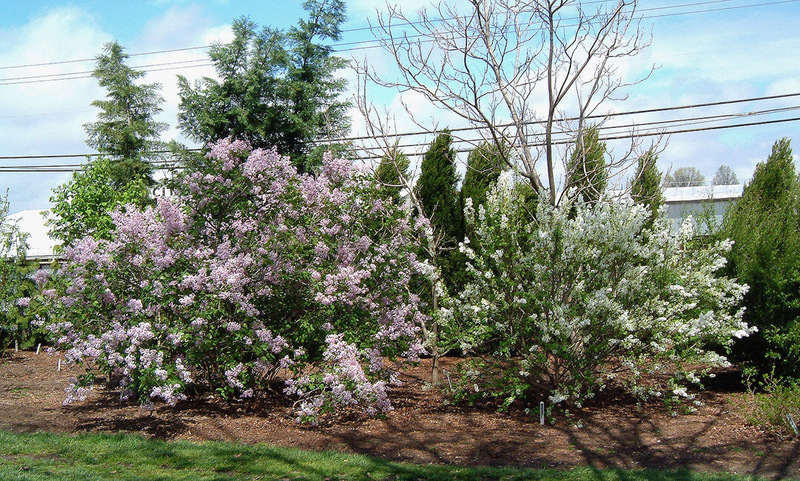 Syringa x laciniata is quite early (March in NC) and useful in a small garden. The richly colored, incised leaf is pleasant in summer and is certainly more interesting than most spring-flowering deciduous shrubs in this aspect. It is also heat tolerant and mildew resistant in warm US climates. It is already being grown by wholesalers from Georgia to North Carolina. It has also proved to be cold hardy to USDA 4 so it's potential range of usefulness in the modern landscape is very wide. It needs a bit of corrective pruning early in life to keep it dense. 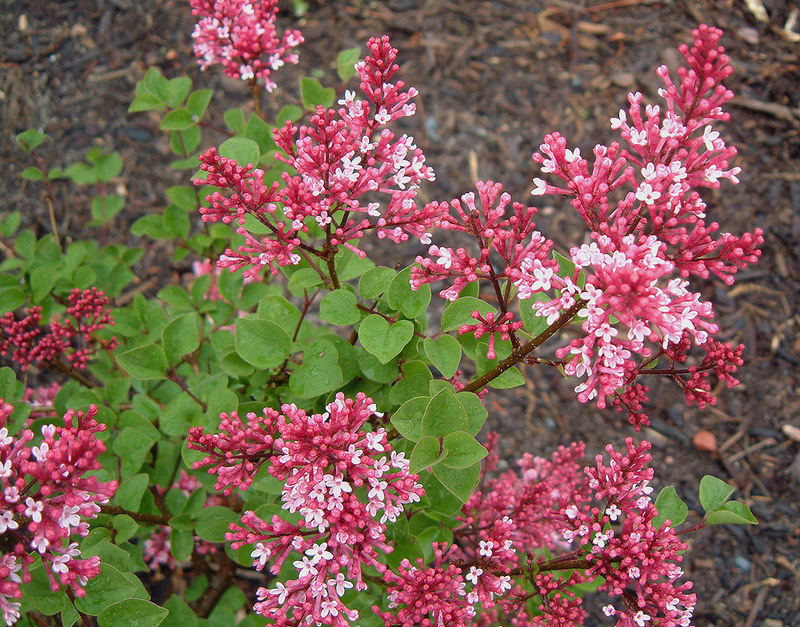 Syringa TINKERBELLE™ is a remarkable cultivar for it's small leaf, compact size, and simply glorious bicolored pink flowers. It is fairly close to a true cherry red in bud and that is not available in any other dwarf lilac we know. The contrast of the bright, almost lime green new foliage with the buds is more than this photograph can convey. This plant bloomed April 19th, 2003 at the Greensboro Arboretum in NC. web: Directory of International Registration Authorities. This is the official register of all known cultivars and their synonyms written by registrar Freek Vrugtman. This site is the ultimate authority for cultivar nomenclature and should be consulted by anything interested in the genus. li: Bilov, V.D. et al. 1974. Siren (lilac). Hayka, Moscow. (in Russian). li: Dvorak, J. Jr. 1978, A four year study at Lilac Park. The Morton Arboretum. NEW. li: McKelvey, S.D. 1928. 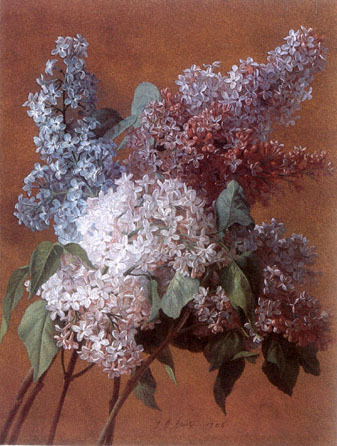 The lilac. Macmillan. New York. li: Meyer, F. 1952. Flieder.- Ein Einblick in die Gattung Syringa für li: Gärtner und Gartengreunde. Ulmer, Stuttgart. li: in the genus Syringa. Res. Rep. no. 49. New Hampshire Ag. Exp. Stat. li: Sciences, Kiev. (in Russian). li: see Lilacs 11(2): 1-27 (1982). li: register of of cultivar names in the genus Syringa (1976). Contrib. li: no. 73. Royal Botanical Gardens, Hamilton, ON." li: Committee of the American Association of Botanical Gardens and Arboretums. A.H.
li: Scott Horticultural Foundation, Swarthmore, PA.
ht: 9.75 ft. tall x 13 ft. wide in 16 yrs. ha: compact, rounded - more compact than older white cvs. 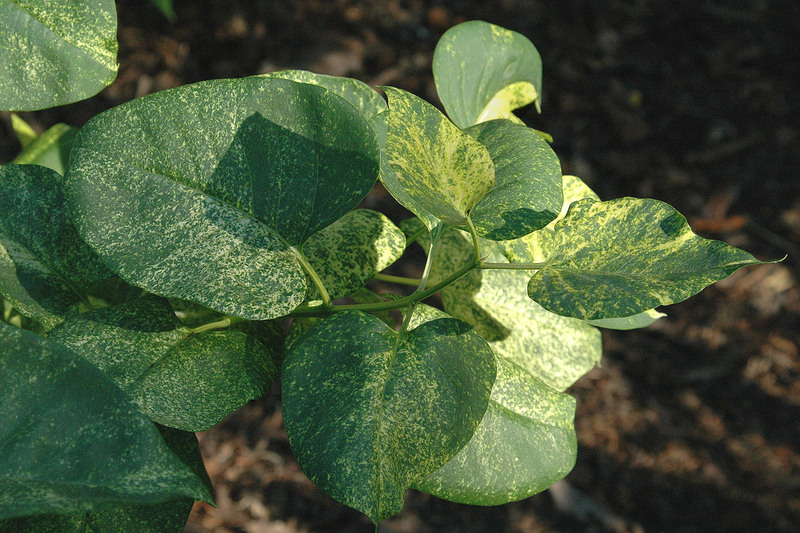 dr: mildew tolerant foliage unlike many older cvs. or: S. oblata from China collected in 1976 as male parent. Female parent not reported. in: US National Arboretum for evaluation in 1992. To trade in 1997.
lu: adapted to warmer climates including CA, NC, TX, VA, MS, MD, GA, TN, SC. so: Spring Meadow Nursery (wholesale) 1-800-633-8859.
li: Vrugtman, F. 1989. Lilac registrations 1988. HortScience 24(3): 435.
bt: about one week before most pink S. vulgaris cvs. 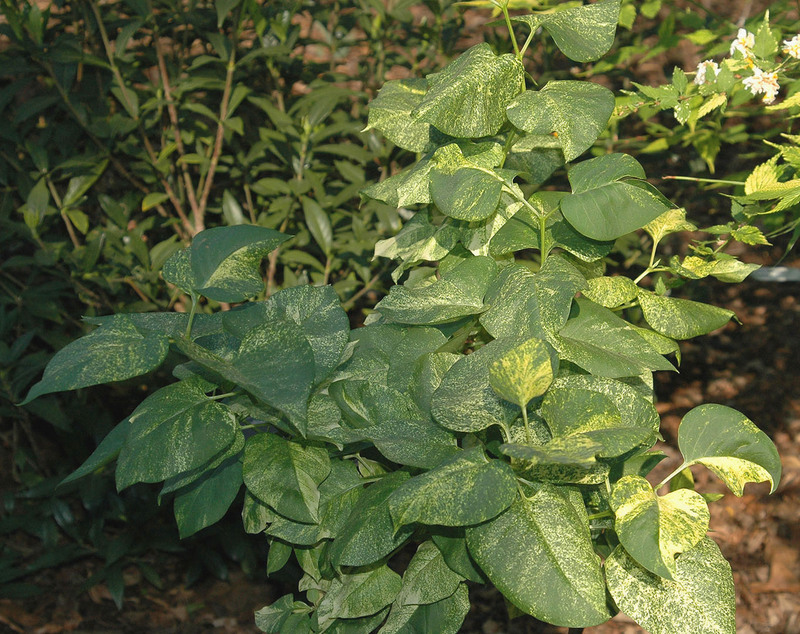 dr: resistant to Cercospora blight and Pseudomonas syringae. bt: before most French hybrids of similar color. li: Schneider, C.K. 1910. in Feddes Rep. 9: 82.
or: by Joseph Rock from Gansu, China in the 1920's. or: this true wild species. lc: mottled and margined yellow becoming cream marked by mid summer. in: Select Plus International Nursery c. 1999.
li: Vrugtman, F. 1991. Lilac registration 1990. HortScience 26(5): 476.
li: Vrugtman, F. 1988. Lilac registration 1986-87. HortScience 23(3): 458.
li: Fiala, J. 1988. Lilacs. 7, 101,224. Timber Press. ht: 5-6 ft. tall x 4-6 ft. wide - it is not a dwarf as wrongly described elsewhere! bt: a full 3-4 weeks of similar color. li: American Nurseryman December 15, 1995: 33.
or: Arboretum in Esperance NY. Selected in 1981.
ha: remains compact over many years. lu: heat tolerant to USDA zone 8.
rai: cultivars of northern origin. ha: 1.7m tall x 1.2m wide in 18 years - not suckering by 18 years. or: Arboretum in Esperance NY. Selected in 1981. First bloomed 1975.
or: Glenn Viehmeyer c. 1970 from irradiated seed of unknown parentage. or: the ortet was selected in 1982.
fc: so contrasts vary considerably.